Himanshu Kumar is no Gandhi. Yet, he has Gandhian aspirations to the extreme. While Gandhi wanted to bring independence for the nation, Himanshu wants to bring peace and justice to the millions of tribals across the nation. By a quirk of fate, the place he chose for his ashram, Dantewada, 17 years back, is today at the heart of conflict. Maybe it was destiny that a man who shares his birthday with Swami Vivekananda and follows Mahatma Gandhi, both of who wanted the rest of the world to see the poverty rampant in the nation and to work towards eliminating it, were to get acquainted with the people, the territory, the culture and the language, so that when the time came, he would stand up for them, when no one else would. Become their voice, when theirs would be silenced with naked terror. Yet, even by a large stretch of imagination, it does not seem to me that his notion of justice could be achieved in a world increasingly hostile to tribals and their beautiful way of life. Then I wonder, if I had met Gandhi while he was still Mohandas and not Mahatma, wouldn’t I have felt the same about a man ready to take on the most powerful empire on the planet armed with a charkha, ideologies of truth and non-violence, and a frail lean body that could be blown with the wind? And wouldn’t I have had to eat my own words on August 15, 1947? Yet, I doubt. For the odds seem impossibly stacked against Himanshu Kumar. The government of the ‘largest’ (and one of the most corrupt, inefficient and iniquitous) democracies of the world hates him because it want the minerals that tribals live over, so that the GDP can show a rise of a few points. And Himanshu asks them not to do so. The state sponsored militia ‘Salwa Judum’ wants him dead because he is exposing the thousands of murders, rapes and abductions they have committed in the last 5 years of their existence in the name of fighting Maoists and Naxalites. The police hate him because they were hand-in-glove with the Salwa Judum SPOs (Special Police Officers). The politicians, who will get their share of the mineral profit, can’t wait to get started if only this stubborn man were not standing before them asking them to be fair. The Naxalites have attacked him because he’s a ‘bloody’ Gandhian who talks of peace and non-violence even at terrible state crimes. The intellectuals have not aligned themselves to the Adivasi cause as they had to the peasants cause during the times of Mahatma Gandhi, Vinoba Bhave and the Naxalbari uprising. Aspiring and established politicians are wary of what Himanshu attempts to expose as it has nothing to offer them since even the votes are scattered all over the place (the Adivasis have a literally spaced out existence). The bulging middle class of India ‘shining’, the ones who fantasize about Che Guevera or Netaji Bose, are content fantasizing. After all, fantasy of revolution is a complete package minus the trouble of disappointment, which the TV generation of today can’t afford to waste time on. Worst of all, the tribals are themselves not too keen on justice, as I was witness to yesterday, after they were threatened repeatedly. 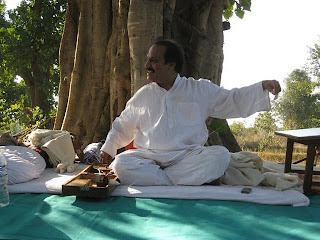 Yet, here stands this man who heeded Gandhi’s call (his father has been associated with both Gandhi and Vinoba) to go to villages and work, and 17 years ago, camped in the district of Dantewada in the middle of a Chhattisgarh jungle and built a place for their awareness as citizens of the nation, aptly called ‘Vanvasi Chetna Ashram’ (VCA). Yet, this May, over a thousand armed men and women (police, army, Salwa Judum), came and demolished this place, legal papers in hand (even after the Gram Sabha had given them the land). Today, at his residence, the books inside the cupboards lie disheveled ever since that day, because their keys were lost in the melee of destruction and there is no keymaker in Dantewada. Despite the odds, there must be something about a man who really, really, really angers everyone, right from a local politician to the Home Minister of the country and heads of many billion-dollar companies across the world. Why would they stop him when he goes for a padyatra (foot march) to the jungles? Or deny him permission to do a satyagrah (a peaceful protest)? Or have 50 odd Salwa Judum supporters shout slogans against him outside his home, threatening his life? Why would the landlord of the house where he says today, plead him to vacate saying it’s the question of his life? Why would the lodge where he had given the advance to book rooms for people who’d be coming for his satyagrah, return the advance stating that he had received orders from the collector’s office? Why would a group of 34 women and 5 men coming to join him during his satyagrah, be stopped many times en-route their journey for flimsy reasons and finally be prevented from going to Dantewada? Why would news be splashed across a channel (CNN-IBN) stating that the roads to Dantewada from Raipur were blocked even when I passed through and reached Dantewada before time? Why would only those that lied and stayed below the radar like me reach the place a day before he begins fasting? Why should he have to resort to a private fast, instead of a public one, which he began in solidarity with the tribals today, and do so without making any demands? Why would a page full of negative writing against him suddenly appear today, in a local paper? His tactics are completely Gandhian and the reaction of the administration, expected. They have hoped something would work: destroying his ashram, arrest of his most important volunteer Kopa Kunjum on false charges, beating of a lawyer who worked with him, bad press, Salwa Judum threatening to kill him right outside his home, preventing him from doing anything he wants to do… the list goes on. Nothing has. And, he cannot be ignored either for his very existence, like Gandhi’s, pricks at the conscience of all of us enjoying the India shining, while mostly it is actually India dying. The difference between the haves and haves-not is increasing and the only reason bits of India seem to shine is because the number of ‘haves’ has increased considerably. Sadly, so has that of the ‘haves-not’, and at a much greater pace and in much larger numbers. Dr Binayak Sen, another man who raised his voice peacefully against the administration’s violence and was arrested and illegally detained for two years (something they might do to Himanshu any day, i.e., if they don’t kill him first), says, “Thirty three per cent of Indians are malnutritioned. The UN puts every nation that reaches a 40% malnutritioned population into indefinite emergency. We have had chronic malnutrition since decades now. What do we do about it?” He explains that in parts of the country, especially the tribal belt, malnutrition is often as high as 90% of the total population. Hence, when the ‘have’ part of India is told about the ‘have-not’ part of it, it pricks them and they react with disbelief and verbal violence without bothering ever to check it out. I believed, yet I wanted to see for myself. And yesterday I saw, the whole cycle of terror and violence coming to fruition right before my disbelieving eyes. The scenery just outside the village of Samsetti was so idyllic, the city dweller in me almost expected to bump into a resort. Instead, I got to see close to 100 men wearing army fatigues and armed with automatic rifles, march out of the village with a few men tied with ropes. The story begins a year and a half back, when the Salwa Judum, in one of their raids of the village, raped four women. Inspired by the confidence instilled in them by Himanshu and his VCA volunteers, the four women filed a case in the court against them, which the court has been pushing the dates for. Six days ago, these four women were forcibly taken from the village, kept in illegal detention for four days without food and told to put their thumb impression on blank sheets of paper. The entire village was threatened with extinction if they continued with the case. Four days later they were returned to the village. Yesterday, when we were there, 100 kms from Dantewada, we saw 100 odd armed men come out of the village. Hence when we went in, the villagers hid the girls. For four hours, we talked to two of them, with the villagers, trying to convince them of taking the legal course. But the fear had so deeply been entrenched in them, that they refused. We returned empty-handed. The logic that now the Salwa Judum will not dare to burn the village (as they have done to many villages) because the case is in court, fell on fearful ears. The Town In-charge (a post equal to a Police Inspector in a city), came to see Himanshu and asked him what a satyagrah meant. After he left, Himanshu explained that the man perhaps wanted to hear him say he was conducting a satyagrah, for then he could arrest him as the state had denied him permission to do so. But he believes he would be arrested soon nonetheless. The man sees me writing something frantically in a piece of paper and I catch him checking me out from the corner of my eyes. He asks Himanshu about me. He expresses surprise that I am from Mumbai. Someone later tells me that he was surprised that anyone managed to sneak in. Another said, I was marked. For what? Imagine his surprise if he were told that two Mumbaikars, me and Priyanka, were fasting with him and that there were people in Delhi, Mumbai and Chennai who were doing something similar in solidarity with Himanshu. Can one man sitting under a tree, spinning his charkha making thread, not eating anything, in a village rarely anyone has heard (forget going there), aspire to be a Gandhi, to live by the Mahatma’s principle, and succeed? His guru did it. He ‘wishes’ he could. I don’t know whether he can. You tell me, can he?